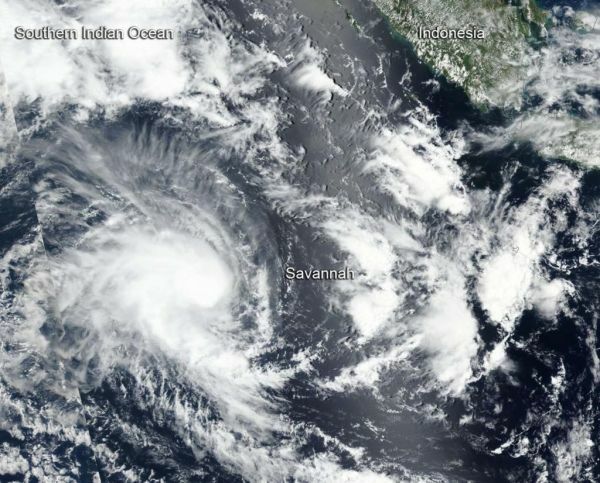 Tropical Cyclone Savannah continued to move in southerly direction in the Southern Indian Ocean and move away from Indonesia. NASA-NOAA’s Suomi NPP satellite provided a visible image of the storm. Savannah is no threat to land areas. Suomi NPP passed over Savannah on March 15 and the Visible Infrared Imaging Radiometer Suite (VIIRS) instrument provided a visible image of the storm. The VIIRS image showed a rounded area of storms around the low-level center of circulation with a band of thunderstorms feeding into the center, extending to the southeast. The Joint Typhoon Warning Center (JTWC) noted “animated enhanced infrared satellite imagery depicts a consolidating system with a central dense overcast feature persisting over the low-level circulation center.” A microwave image showed tightly-curved bands of thunderstorms wrapping around an eye feature, indicating the storm was strengthening.